ARK: Survival Evolved (game, 2017). An action-adventure survival video game by Studio Wildcard/Wildcard Properties. Developed by Studio Wildcard, Virtual Basement LLC, Wildcard Properties. Official Trailer. ARK: Survival Evolved is an action-adventure survival video game by Wildcard Properties and Studio Wildcard, developed by Studio Wildcard, Virtual Basement LLC and Wildcard Properties. 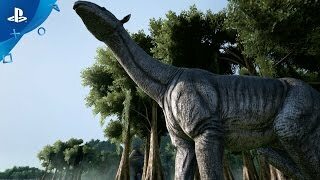 ARK: Survival Evolved - Survivor's Pack Launch Trailer | PS4. Ark: Survival Evolved is an action-adventure survival game set in an open world environment with a dynamic day-night cycle and played either from a third-person or first-person perspective. To survive, players must establish a base, with a fire and weapons; additional activities, such as taming and feeding dinosaurs, require more resources. The game's world, known as the "Ark", is approximately in size: there is approximately of land with of ocean. There are currently 132 species of creatures that populate the world of Ark. The majority of creatures can be tamed by the player, though some, such as Meganeura or Titanomyrma, cannot. Creatures in the game can be tamed, and the method varies creature by creature. Most are "violent" tames, meaning the players must knock the creature out using blunt weapons, such as a club, or through the use of tranquilizing projectiles like tranq darts. Once knocked out, the player can feed them food, such as berries for herbivores or raw meat for carnivores, with different foods taming at different speeds. Some creatures can also be tamed passively, by approaching them and carefully giving them food. Once a creature is tamed, it will follow the commands of the player who tamed them. As well, most creatures can be ridden, and therefore allow the player to utilize the creature's abilities, such as flight or fast underwater movement. When riding atop certain creatures, players may still be able to use weapons. They can also be used to carry items, and players can issue offensive and defensive commands to them; for example, a pack of Utahraptors can be assigned to defend the base, or a group of Triceratops can be ordered to attack an enemy's base. 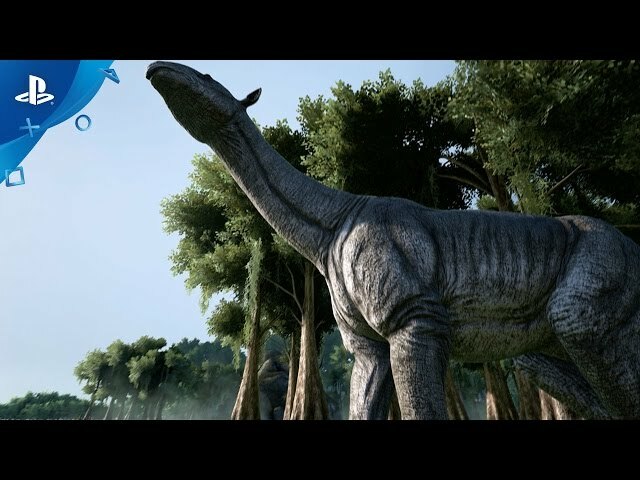 Some of the larger creatures, such as a Brontosaurus or Mosasaurus, can have a building platform placed on their back, giving players a mobile, though small, base. The game also features various other animals, such as the dodo, saber-toothed tiger, woolly mammoth, Meganeura, Titanomyrma, and Doedicurus. Every creature in the game has living ecosystems and predator hierarchies. Ark: Survival Evolved is an action-adventure survival game set in an open world environment and played either from a third-person or first-person perspective. To survive, players must establish a base, with a fire and weapons; additional activities, such as taming and feeding dinosaurs, require more resources. The game's world, known as the "Ark", is approximately in size: there is approximately of land with of ocean. ARK: Survival Evolved was scheduled to be released by Studio Wildcard and Wildcard Properties on June 12, 2017, on August 27, 2017, on August 29, 2017, on December 19, 2017, on June 14, 2018 and on November 30, 2018. It is a multiplayer, single-player and cooperative gameplay video game. This video game is available for the following platforms: Linux, Microsoft Windows, macOS, PlayStation 4, Xbox One, Android, iOS and Nintendo Switch.